The major UCLA flood from a water line rupture got us thinking about water pipe maintenance. Water main breaks are caused by a variety of factors, including freezing or severe weather, pipe corrosion, soil conditions, age, ground movement, or being struck by heavy equipment. To help prevent small leaks from becoming big problems, look for these signs and notify your city’s Utilities Department immediately if you notice anything unusual. Water leaking around a metal cap on the ground that has “water” stamped on top. Water leaking out of a fire hydrant nozzle cap. Water seeping up out of the ground around a fire hydrant. Water seeping up out of the ground or pavement area. 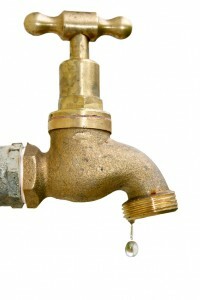 Your water service line leaking on your property. Saturated soil, standing water and water flow from the water meter. Sinkholes or undermined streets or sidewalks.